The animal's head and leg were freed from the tyre using specialised cutting equipment. Keepers at Edinburgh Zoo called out the Scottish Fire and Rescue Service as their "last hope" after failing to free Qabid, a juvenile male rhino who had its head and leg stuck in the tyre. A spokeswoman for the fire service said: "Crews from Sighthill fire station attended and freed the rhino using e-hydraulic cutting equipment. "The male juvenile rhino had been trapped with his leg and neck stuck in the tyre since 4pm. "After the tyre was removed the rhino was left in the care of zookeepers and vets. 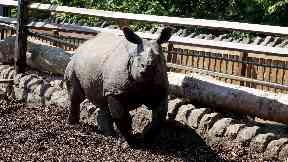 "One zookeeper said the fire service were their last hope since the zoo had been trying to free the rhino since 4pm." Darren McGarry, head of living collections at Edinburgh Zoo, said: "Our greater one horned rhino Qabid loves to play with his tyre, it's one of his favourite things to do. "On Sunday, he managed to get his head and a leg stuck while playing and we had to contact the fire service for assistance to use their specialist cutting equipment. "The tyre was safely removed and Qabid is doing fine. "We would like to thank the fire service for their help."